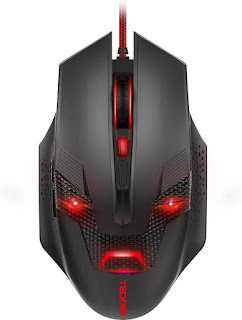 TeckNet M268 RAPTOR Gaming Mouse: Take control of the game with the TeckNet RAPTOR High Precision Gaming Mouse. Designed for comfort and built for precision, this is one bit of kit no gamer should be without, at a price every gamer will love. 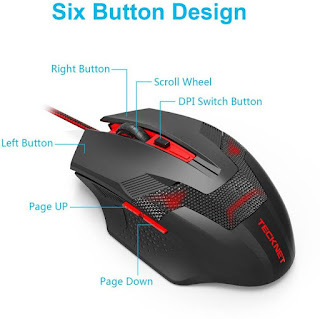 Get the edge with this high-quality, low-cost 6D optical gaming mouse with TruWave sensor.The integrated 2000 dpi optical gaming sensor and adjustable dpi setting (1000/1600/2000), plus smooth-gliding underside provides ultimate cursor control when you need it most. 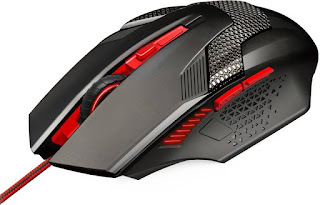 What's more, by adding 40g of extra weight to the mouse and incorporating an ergonomic design that fits the natural curves of your palm, this mouse can be used for hours in comfort Accuracy is everything: RAPTORs features exclusive TeckNet TruWave sensor optimizations for high-accuracy cursor control. Whether zipping across the screen or honing in on a single pixel, the 2000 DPI sensor responds accurately to your hand movements. This mouse also can be used on any surface, including transparent glass Fits Like a Glove: Ergonomically designed to fit snugly under the palm of your hand with intuitive button placement for the most comfortable gaming experience yet. Be ready in an instant: Make the right moves in any game situation. Shift through up to three DPI settings, from pixel-precise targeting (1000 DPI) to lightning-fast maneuvers (up to 2000 DPI) with a single button press, conveniently located behind the scroll wheel Built for Winners: Developed with gamers in mind, every component from the smoothly braded cable and tactile surfaces to the gold plated USB connector is constructed from the highest quality materials. TeckNet 18 Months Warranty: At TeckNet, we believe in our products. That's why we back them all with an 24-month warranty and provide friendly, easy-to-reach support.